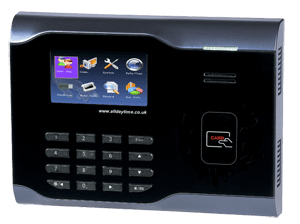 Contactless Technology allows users to clock in or out without the need to touch anything at all. This has several advantages such as the prevention of cross contamination in hospitals and clinical environments. Also because no moving parts are present this eliminates mechanical breakdown and increases reliability with less down time giving a system you can rely upon. stored as an in or out transaction. This technology can be hidden in many other items such as a watch or luggage tags and is commonly used in retail establishments to prevent theft.